Crystal Lattice is a three-dimensional representation of atoms and molecules arranged in a specific order/pattern. In other words, a crystal lattice can be defined as a geometrical arrangement of constituent particles of matter (atoms, ions or molecules) as points in space. There are total 14 possible three-dimensional lattices. Crystal lattices are also known by Bravais Lattices, named after the scientist Auguste Bravais. 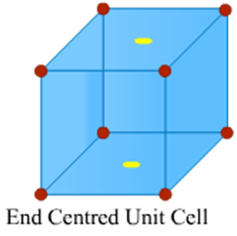 The smallest possible portion or part of the crystal lattice which repeats itself in different directions of the lattice is called the unit cell. Many unit cells combine to geometrically form the crystal lattice. The unit cell in which the constituent particles (atoms, ions or molecules) are located only on the corners of the lattice is called A Primitive Unit Cell. The unit cell which contains one constituent particle (atom, molecule or ion) at its body centre and other constituent particles are located on the corners is called Body Centred Unit Cells. The unit cell which contains constituent particles (atoms, molecules or ions) on each face of the unit cell and other constituent particles on the corners is called the Face Centred Unit Cell. In an end centred unit cell, one constituent particle (atom, molecule or ion) is present at the centre of opposite faces besides the ones located on the corners. Cubic Lattice: Cubic lattice is formed into three possible geometries of unit cells: primitive, body-centred and face centred unit cells. In a cubic lattice, all the edges are equal and the angle between their faces is 90° that is, mutually perpendicular. Monoclinic Lattice: Monoclinic lattice is formed from two types of unit cells namely: primitive and end centred. Monoclinic lattice has unequal sides and two angles between the faces of the lattice are 90°. Hexagonal Lattice: Hexagonal lattice is formed from only one type of unit cell that is, primitive. In hexagonal lattice, only one side and two angles are 90° and one angle is 120°. 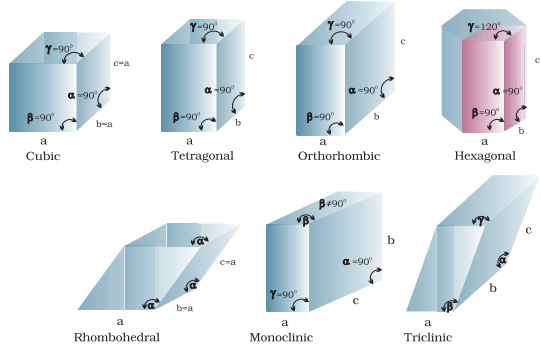 Rhombohedral Lattice: Rhombohedral Lattice is also formed from one type of unit cell that is,  primitive. In Rhombohedral Lattice all the sides are equal and two angles between the faces of the rhombohedral lattice are less than 90°. Triclinic Lattice: The formation of triclinic lattice also takes place from one type of unit cell that is, primitive. In triclinic lattice all the sides are unequal and none of the angles between the faces of the triclinic lattice are 90°. The table given below can be used to summarize types of lattice formation.